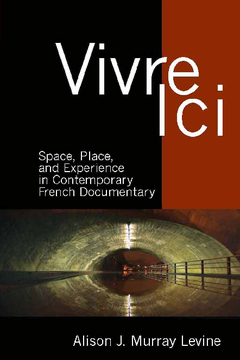 Vivre Ici invites the reader on a journey through the vast viewing landscape of contemporary French documentary film, a genre that has experienced a renaissance in the past twenty years. The films explored are connected not just by a general interest in engaging the “real,” but by a particular attention to French space and place. From farms and wild places to roads, schools, and urban edgelands, these films explore the spaces of the everyday and the human and non-human experiences that unfold within them. Through a critical approach that integrates phenomenology, film theory, eco-criticism and cultural history, Levine investigates the notion of documentary as experience. She asks how and why, in the contemporary media landscape, these films seek to avoid argumentation and instead, give the viewer a feeling of “being there.” As a diverse collection of filmmakers, both well-known and lesser-known, explore the limits and possibilities of these places, a collage-like, incomplete, and fragmented vision of France as seen and felt through documentary cameras comes into view. Venturing beyond film analysis to examine the production climate for these films and their circulation in contemporary France, Levine explores the social and political consequences of these “films that matter” for the viewers who come into contact with them. Alison J. Murray Levine is an Associate Professor of French at the University of Virginia.